Moving from one state to another is exciting. You and your family get to enjoy discovering a completely new area and uncovering all the unique and interesting things another part of the country has to offer. Once you’ve chosen your new location and made the decision to move, it’s time to get Mid Atlantic Van Lines involved. We have years of experience as an interstate moving service, packing your furniture and belongings and moving them to your destination. There’s no need to worry about packing and moving your home when you can let our friendly and professional team take care of it for you. Free no-obligation quote: It’s fast and easy to get your free quote. Simply fill in our online form with a few details about your move, and we’ll estimate the costs for you. You can also make special requests and include large, bulky or furniture that can’t be dismantled. Safe and sure packing and handling: Our courteous and conscientious movers treat your belongings with care. They plan the necessary boxes, containers and covers so your furniture and personal items stay organized and damage-free. They’ll also label every room for fast and easy unloading upon arrival. Secure storage if necessary: Sometimes it’s not possible to make your interstate move right away. If you need to leave your current home before the new one is available, we can propose our clean, safe and secure storage to keep your belongings until it’s time to make the move to your new state. Reliable and dependable moving: As a licensed and insured moving company, we employ professional drivers that will take good care of your furniture across the miles. Our modern fleet of moving vans and trucks crisscross the country and are properly maintained for reliable moving. 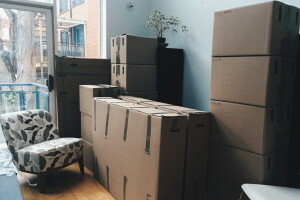 Organized unloading and unpacking: The last step in your interstate move is the most exciting one: setting your furniture up in your new home. With your guidance, our movers carefully install your furniture where you’d like it and place all of your goods and possessions in the correct rooms of your new home. There’s no need to stress over an interstate move when you trust your move to us. We think it’s important for you to focus on the exciting adventure you and your family have ahead of you. Turn to Mid Atlantic Van Lines as your Baltimore, Washington DC or Northern Virginia interstate moving company for your move and let us organize packing, storing and moving your furniture so you have one less hassle and one more reason to enjoy your move.